Lynn Beisner shares the marriage maintenance formula prescribed to her by a therapist, which includes fun, laughter, and the occasional vacation. This week, my husband Pete and I are on vacation. That might not seem like a radical thing to you, but for me it is an act of cultural disobedience. For starters, this is not a good time. Pete is one of the many Americans who has seen their secure job turned into a never-ending stream of temporary contracts. And his contract ends the last day of this month. In the past, it has taken as long as six months for him to find another contract, so we could be looking at a year of severely diminished income. With that looming financial uncertainty, you would think that Pete would use any available leave-time to look for a job. It would also make sense for us to be saving every penny that we come across rather than incurring the enormous expense of a week’s vacation. What makes our decision to take a vacation even more radical is that we are not the kind of people who usually take vacations. Pete has a work ethic that would make most Puritans hang their heads in shame. And I can be thrifty to the point of being miserly. When Mr. All Work and Ms. Never Spend get married and build a life on their shared values, they almost never take vacations. We are on vacation because we have developed an almost superstitious belief in the relationship maintenance plan that a therapist friend told us about years ago. She claimed that it was a magical formula for long-term relationships, and that if we used it she could guarantee us a long and happy relationship. On some level, we knew that she was full of crap: There are no magic formulas. But we both love the certainty of numbers, the knowledge that there is a right answer that can be reached by following the right steps. It didn’t hurt anything that our friend’s formula was built around the metaphor of a bank account and saving. You have to put more into the relationship than life takes out of you in stress. Plus, you need to have a bit of surplus in savings for when life throws unexpected stressors your way. I was eating up her idea like deep-fried crack until she told me what counted as a deposit: having fun together. And here is where the formula came in. 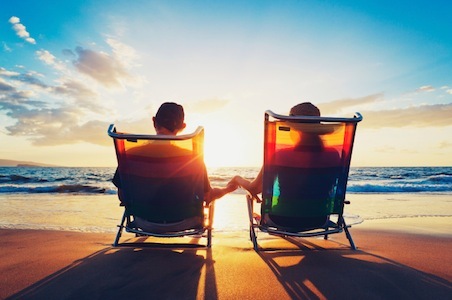 For a life of average stressors, a couple needs to have fun together 15 minutes a day, and additional blocks of three hours per week, one day every three months or one weekend every six months, and a week-long vacation every four years. You need to have enough fun to get you through daily stressors, but you also need to build up enough in reserve to get you through huge stressors like the death of a parent or a financial crisis. We thought that she was a bit daft. For starters, who has that kind of time? And with all of our cultural wisdom saying that it takes hard work to make relationships successful, who advises people to have fun? But we were fighting a lot at that time. And we figured that the worst that could happen if we tried her formula was that we would have some great memories after the divorce. I am not going to say that it saved our marriage. But as we started having fun together again, we at least remembered what it was that we were fighting for. And there was something about having fun together that felt like falling in love again. To this day, we still follow the formula. We aren’t all that religious about the 15 minutes per day. But we do try to have a day of fun at least once every six months, and we have gotten almost superstitious about taking the week-long vacation roughly every five years. We might let ourselves go overdue, but we never skip one. Going into a stressful time like the one that we are facing without this vacation would be like going on a trip through Death Valley when your “Check Engine” light is on. The sad thing is that our scheduled maintenance vacations are the only vacations we have ever taken. And most of the fun we have had was because we were “due.” It makes me wonder, even if our relationship had survived, what would it look like, who would we be if we had not made ourselves take time for fun? I have started to wonder if the reason that so many mid-life crises involve a younger romantic partner is that younger people are typically more playful. Fun is life-affirming, and as we age, life needs all the affirmation it can get. As Pete and I make our way through mid-life, I can’t help but wonder how different it might be if we had not made our commitment to fun, and how different still it might be if we didn’t need it to be prescribed and regimented. Of course there comes a point in every long-term relationship when it stops being about fun and play and it becomes about the business of being a couple. We settle into grown-up roles, and we start worrying about things like schedules, chores, and money. We forget that fun has the ability to fuel love and that play fosters creativity and a joy for life. I am becoming convinced that it isn’t just romantic relationships that are fueled through fun. I am beginning to think that it is what binds families together as well. Sure, parenting is about putting meals on the table, countless loads of laundry, and mountains of homework. But what knit our hearts together as a family was the games we played over those meals, the times we as parents abandoned our adult dignity and joined our children playing in the surf, and the stupid family jokes that we all still laugh about. Here is what is truly radical about believing that fun is the fuel of relationships and families: It flies in the face of our beliefs about what makes us virtuous and good. We believe that work, busyness and even stress—not play and fun—are the hallmarks of good families and partners. So, Pete and I are going on vacation because we won’t have fun without a therapist-approved excuse and because we superstitiously believe in a formula. But we are also doing it as an act of cultural disobedience. For one week, we are prioritizing pleasure over work, our relationship over our bank account, and fun over our cultural fetish of stress. We are stating that the most important thing we can store in preparation for difficult times to come is a few shared moments of joy. What Does My Crush Say About Me?